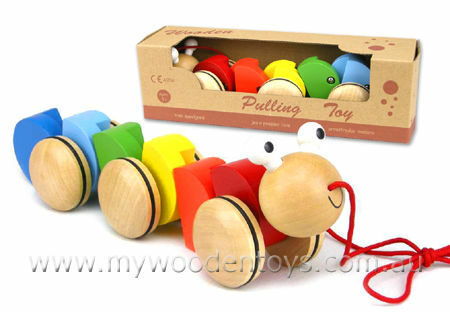 Caterpillar Wooden Pull A Long is a beautiful bright wooden toy which wiggles and wobbles as you pull it along. This caterpillar has a segmented body and six robust wheels with rubber inserts so it wont slip on the floor or damage it. This is a great toy for your little one to pull around the house and its happy face and undulating body make it very funny to watch. We like this because: "Very well made and a lovely wriggly movement "